Installation of a new home heating system can save on running costs year after year. Whether you are looking for furnace installation for a newly built home, or furnace replacement for your existing home, Ameri-Mech does it best! 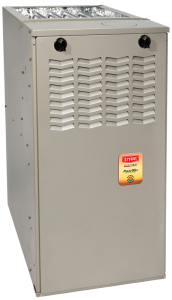 The latest condensing gas furnace technology can have an AFUE rating as high as 97%, while hybrid systems can combine the benefits of heat pump exchangers in the right conditions with a convention furnace to switch to the most efficient form of heating for the temperature conditions. These systems are considerably cheaper to run than systems that are more than ten years old. 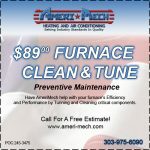 Call Ameri-Mech Heating and Air Conditioning at 303-975-6090 Now. The EPA emphasizes the importance of expert installation to get the most out of your new heating system. The efficiency ratings from the manufacturer can’t be achieved without making the most of the conditions of your home. Putting a system in the wrong place, or having poor ducting, can greatly reduce the potential energy savings of your new home heating system. That’s why it’s important to choose respected heating installation specialists like Ameri-Mech. Not only are we experienced, insured and fully certified, but we’re a local Longmont company. For the ultimate in home comfort, we offer zoning of home furnace installation into different areas. Not only does it mean that the whole family can have individual levels of comfort, but it can save you on your heating and cooling costs as well. With zoning, you only need to heat and cool the areas you’ll be using – you don’t have to heat or cool the entire home to be comfortable in a single room. We also service what we sell. We offer furnace maintenance agreements. Whether you are a contractor or a homeowner, you will be impressed with the quality of our gas furnace installations and heat pump installations. Our coverage area is north Metro Denver, Longmont, and Boulder Co. Call today 303-975-6090!